As a longtime romance reader, one of my favorite traditions is Christmas in July. While the temperatures outside skyrocket into hot and humid territory, readers throughout the romance community chill down with wintry holiday love stories. Even the Hallmark channel has a Christmas in July celebration going on right now. Because I love Christmas stories, I write one every year. I’ve already started my next one that is based on Miracle on 34th Street. That book won’t be released until the fall, but my last holiday romance was called The Christmas Sparkle Test. So if, like me, you enjoy escaping the heat and sinking into books filled with holly and snow and carols and Christmas trees all wrapped up in a heartwarming romance, come check out my HolidayLuv series. 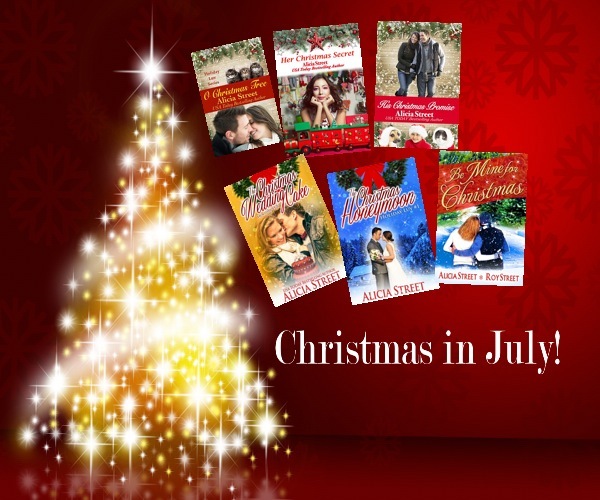 Each short and sweet romance is only 99 cents, so you can binge read a happy Christmas in July! Hurray for Christmas in July, Alicia! I happily agree and love to celebrate Christmas at this time of year! I saw your new Christmas book, Josie and can't wait to read it! I love the Christmas in July tradition. I saw a lovely commercial on TV last night from a store that's having a sale on their Christmas items and it made me long for Christmastime.